It’s not every day that a skewbald horse that has competed in a Driving competition qualifies for the Longines FEI Jumping World Cup™ Final. 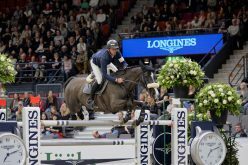 But the 16-year-old gelding, Life is Beautiful, is a real all-rounder, and he can expect a very warm welcome when he enters the Scandinavium Arena in Gothenburg, Sweden as the Longines 2019 Final begins next April, because he is coming home to where he was born. 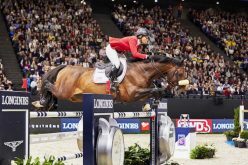 Ridden by 35-year-old Shino Hirota, this special horse competed in five of the six legs of the FEI Jumping World Cup™ 2018/2019 Japan League, and with three wins and two runner-up placings topped the series leaderboard by a long distance to claim a qualifying spot for the Swedish showdown. It will be a huge step-up for Shino, but her horse is likely to take it all in his stride. 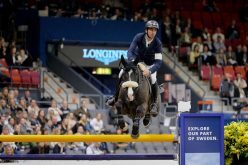 Sold as an unbroken three-year-old to Stefan Karlsson who is based in Markaryd in the south of Sweden, Life is Beautiful was originally named Tour de France and was already showing promise when finishing eighth at the Swedish Young Horse Jumping Championships as a four-year-old. However he wasn’t altogether straightforward. “He was troublesome at competitions, getting spooky and agitated, and I wanted to find a way to help him to settle down – I believe that horses should do a bit of everything!”, Stefan explained this week. So with help from a good neighbour he put him in long-reins, and then Stefan began driving him in a single-harness gig. 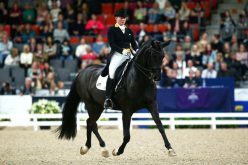 By the time the pair competed together in a Dressage Driving competition at Krapperups Castle on the west coast of Sweden the transformation was already taking place. 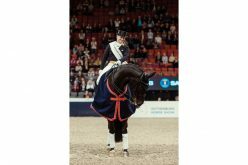 The horse we now know as Life is Beautiful was able to focus on his work, and was also proving quite successful in the Jumping arena under the saddle of Swedish rider Jörgen Larsson. “He was a nice horse but a little too good for me to keep on” said Stefan who has produced many good horses down the years, including one sold to Finland for a national team rider and a thoroughbred mare that found her way into Peder Fredricson’s string when the multi-talented Swede, and current European Jumping champion, was competing in the sport of Eventing. Life is Beautiful was eventually spotted by Kiwi rider Bruce Goodin who advised his business partner, Ryuma Hirota, to buy him. 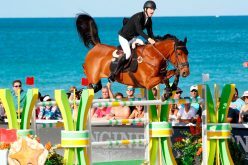 Ryuma, who represented Japan at the 2000 Olympic Games in Sydney (AUS) and at three FEI World Cup™ Jumping Finals, wasn’t overly impressed when he tried him at first because he had such an economic jump. But the higher the fences were raised the higher the horse would go, and from the moment Ryuma’s wife, Shino, took up the reins they really clicked. Now the pair are seen as potential candidates for the Tokyo 2020 Olympic Games on their home turf, so they couldn’t have arrived at the peak of their performance potential at a better time. Stefan meanwhile is planning a visit to Bruce’s yard in Sweden next week to see the horse he still calls Tour de France. “I have very fond memories of him” said the Swedish horseman. All around the globe horses and riders have been hard at work in their regional leagues, and Tegan Fitzsimon (28) posted two wins and two runner-up placings with Windermere Cappuccino to top the New Zealand FEI World Cup™ Jumping series. 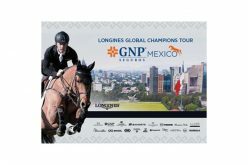 In Australia, Aaron Hadlow (31) and his mare Vahlinvader were qualified for the Longines 2019 Final long before the last round of Australian series that took place in Sale, Victoria earlier this month. It’s a huge achievement for the rider who has a day-job as an Accounts Clerk and who has developed his winning horse from the outset. Brazil’s Luis Felipe Pimenta Alves (34) topped the South American League, Egypt’s Abdel Said (29) won the Arab League North Africa and four-time Olympian Ramzy Al Duhami (47) from Saudi Arabia won the Arab League Middle East. Not for the first time Thailand’s Siengsaw Lertratanachai (22) reigned supreme in the South East Asia qualifying series while the Chinese League was won by Tongyan Liu (51). Each have their own individual story, and success didn’t come without effort. However if there was a prize for fortitude and determination, for courage, team-work, ingenuity and true grit it would go to South Africa’s Lisa Williams (52) and her horse Campbell. They will arrive in Gothenburg in six weeks time after one of the most tortuous journeys imaginable. Having won the FEI World Cup™ South African League for the third time in a row in the 2017/2018 season Williams decided to export the cheeky Campbell, whose stable-name is Dennis the Menace, to Europe. It turned into a four-month adventure that tested the character and resolve of everyone, including her horse. The first 21 days of quarantine in Cape Town were followed by a further 90 in Mauritius which were very tough on “Dennis” who became chronically ill due to the intense heat and humidity. 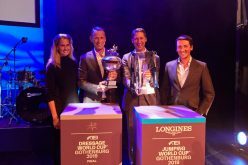 When eventually he arrived in Belgium in March 2018, Williams had less than six months to prepare him for the FEI World Equestrian Games™ 2018 in Tryon, USA but they made it, and have spent the winter months back in Europe preparing for the Longines Final 2019. What a triumph it will be when they ride into the Scandinavium Arena together, flying that South African flag. Meanwhile the complete line-up for the 41st FEI Jumping World Cup™ Final has yet to be decided, with the results of the Central European Northern and South Sub-League and the Longines North American Eastern Sub-League to be decided week ending 10 March.